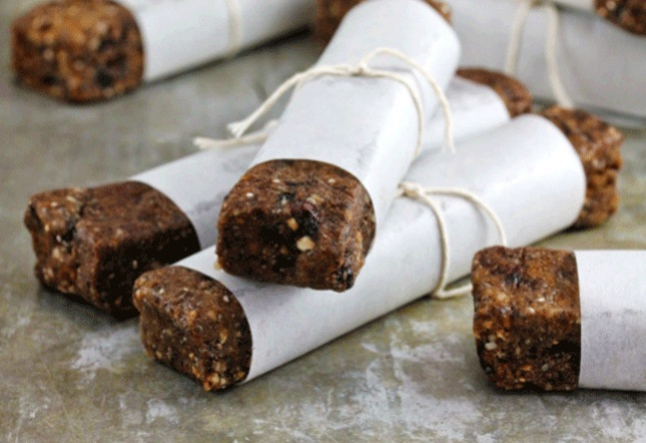 A healthy snack full of superfoods for anyone with a sweet tooth! Pour the 2 tbsp chia seeds into a glass jar with a lid. Add 6 tbsp purified water to cover the seeds and shake well. Allow to sit 15 minutes. The seeds will soak up the water and form a gel-like texture. Chop the dried dates, raisins, and figs. In a separate bowl, soak for 15 minutes in just enough purified water to cover. Using a food processor, blend the sunflower, pumpkin, and sesame seeds into a chunky batter. Add the chia gel, the flax seeds and the salt. Pulse. Add the cacao powder, a bit at a time, pulsing until it blends in. Pour the mixture into a large bowl. Strain the water from the dates, raisins, and figs and then place them in a food processor. Mix until it forms a paste ball. In a large bowl, add the date/raisin/fig mixture to the seed mixture. Hand-mix or use 2 large wooden spoons. When the mixtures are well combined, add the cacao nibs, shredded coconut, and goji berries. Mix. Press into a rectangular glass dish, refrigerate or freeze to set, then cut into bars. Alternatively, you may hand form into desired shape (balls, squares, bars…) or use a biscuit cutter to shape. • Add dried cherries or dried mulberries, or replace one of the other dried fruits. • Substitute Brazil nuts, pistachios, walnuts and/or almonds for the seeds. • Substitute raw tahini plus honey for the dates. Next time you have a sweet craving, give these a try!